Every fall, Dave and I eagerly look for tarantulas. They only show up for a few weeks a year -- that's when the males go out searching for females (the females stay snug in their burrows). In the bay area, there were a few parks where we used to hunt for them: Arastradero, Mt Hamilton, occasionally even Alum Rock. Here in semi-rural New Mexico, our back yard is as good a place to hunt as anywhere else, though we still don't see many: just a couple of them a year. But this year I didn't even have to go out into the yard. 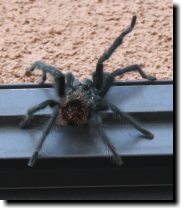 I just looked over from my computer and spotted a tarantula climbing up our glass patio door. I didn't know they could do that! 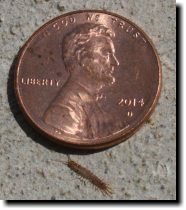 In other invertebrate news: we have a sporadic problem with centipedes here in White Rock. Last week, a seven-inch one dropped from the ceiling onto the kitchen floor while I was making cookies, and it took me a few minutes to chase it down so I could toss it outside. But then a few days later, Dave spotted a couple of these little guys on the patio, and I have to admit they're pretty amazing. Just like the adults only in micro-miniature. Though it doesn't make me like them any better in the house.